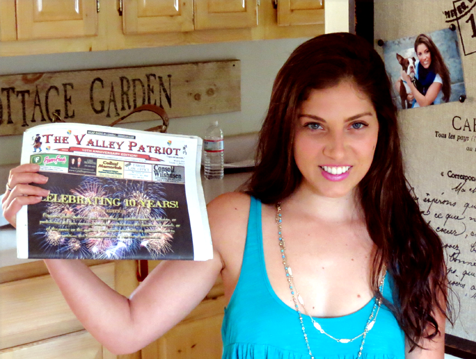 The Valley Patriot sat down with Methuen’s Brittany Baldassari, known in the entertainment business as Brittany Baldi to talk about her success, and see if she had any advice for our readers who want to model, star in TV, movies or music videos. Brittany went to Methuen High School and graduated in 2007. She worked at CVS and Texas Roadhouse before her first modeling job and says she was very athletic. She also says that’s where she got her nickname “Baldi”. “People know me as Brittany Baldi. I got the nickname playing high school sports, softball and field hockey. I still like to play to this day. I love sports. I played travel ball, I played varsity in High school, I should have played in college but I got into modeling. I’ve been living in Methuen my entire life. Brittany has been in several movies, starred in MTV’s “Are You the One?” and was the lead role in the Prospect Hill hit music video “Come Alive”. We asked Brittany how she started on the path to movies and TV and what advice she had for young girls trying to make it. Do you think that’s a good path for young girls who want to get into show business and modeling? “I think it’s a good segue. But this business, modeling and TV, is all about networking with people and making as may connection as you can, till you make the right connections. That’s my biggest tip to people. You don’t want to burn any bridges. You have to understand what networking is and get good at it. It’s a good way to get to know people and it’s a lot of fun, it will take you far. Brittany says that the standard pay for a liquor promo is anywhere from $18 to $30 an hour. Brittany says that there are a variety of marketing companies she signed up with online, sending emails and photos, promoting herself and trying to get her name out to as many people in the industry as possible. Though she says it was hard work and persistence she also admits you have to be lucky. “For me I feel like it was fate and luck. People liked my look and I started getting hired in every job I tried for. Once I got the first job it was like the guy on Wall Street, I just kept getting more and more jobs. So what was your first TV show? “The first TV show I did was in 2010. I was a junior in college. It was on MTV and it was called “Is She Really Going Out With Him?” That involved my (now) ex and a ton of his friends and a ton of my friends and actually took place here (at her home in Methuen). “They followed us around for a couple of days and made an episode about it. It was a one-episode thing and it was a lot of fun. But I got that job from a casting, we just tried out and they liked us and we got booked for it. Next Month Part II Brittany lands “Come Alive” and talks about her first job in movies.